"We have tended to think of Mars as being simple," said John Grotzinger, John Grotzinger Fletcher Jones Professor of Geology at Caltech and former Project Scientist of the Mars Science Laboratory mission. "We once thought of the earth as being simple, too. But the more you look into it, questions come up because you're beginning to fathom the real complexity of what we see on Mars. This is a good time to go back to reevaluate all our assumptions. Something is missing somewhere." Today, Thursday, June 7, at 2 p.m. EDT NASA TV hosts a Live Discussion on New Mars Science Results from Mars Curiosity rover. The results are embargoed by the journal Science until then. NASA’s Curiosity rover landed inside Mars’s 96-mile-wide Gale Crater on August 6, 2012, and since then it has been probing the Red Planet’s geology, climate and the question of whether or not it has ever supported microbial life. Now, the rover has seemingly made a new discovery which will be revealed this Thursday, according to the space agency. NASA has scheduled a live discussion for 2 p.m. ET focusing on “new science results” from the rover, although the nature of what has been found remains to be seen as no details will be made public before then. You can join in on the discussion via social media using the #askNASA. Current models of Mars' paleoclimate—factoring in estimates of the early atmosphere's mass, composition, and the amount of energy it received from the sun—come up, quite literally, dry. Those models indicate that the atmosphere of Mars could not have sustained large quantities of liquid water. Yet the rock record discovered at Gale Crater suggests a different scenario. "Whether it was snowfall or rain, you have geologic evidence for that moisture accumulating in the highlands of the Gale Crater rim," Grotzinger says. In the case of Gale Crater, at least some of the water was supplied by the highlands that form the crater rim, but groundwater discharge—a standard explanation to reconcile wet geologic observations with dry paleoclimatic predictions—is unlikely in this area. "Right on the other side of Gale's northern rim are the Northern Plains. Some have made the argument that there was a northern ocean sitting out there, and that's one way to get the moisture that you need to match what we are seeing in the rocks." 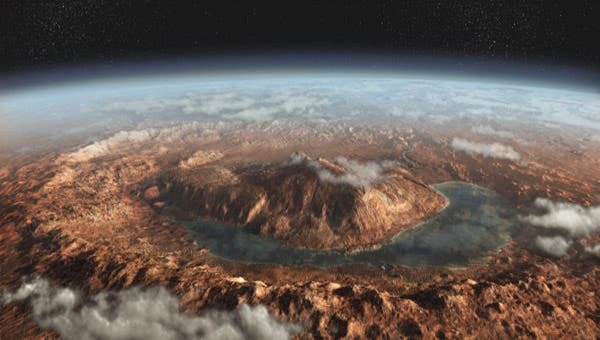 The story of water on Mars that has unfolded is a wet one: Mars appears to have had a more massive atmosphere billions of years ago than it does today, with an active hydrosphere capable of storing water in long-lived lakes. The MSL team has concluded that this water helped to fill Gale Crater, the MSL rover Curiosity's landing site, with sediment deposited as layers that formed the foundation for the mountain found in the middle of the crater today. Curiosity has been exploring Gale Crater, which is estimated to be between 3.8 billion and 3.6 billion years old, since August 2012. In mid-September 2014, the rover reached the foothills of Aeolis Mons, a three-mile-high layered mountain nicknamed "Mount Sharp" in honor of the Caltech geologist Robert Sharp. Curiosity has been exploring the base of the mountain since then. "Observations from the rover suggest that a series of long-lived streams and lakes existed at some point between 3.8 billion to 3.3 billion years ago, delivering sediment that slowly built up the lower layers of Mount Sharp," said Ashwin Vasavada, MSL project scientist. 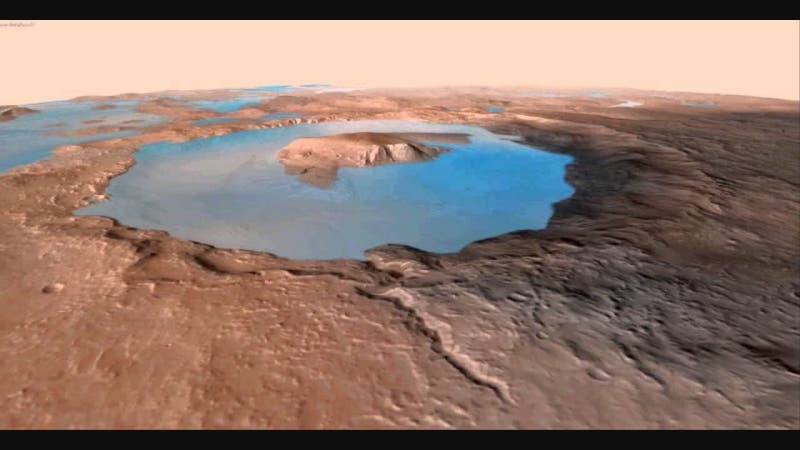 "However, this series of long-lived lakes is not predicted by existing models of the ancient climate of Mars, which struggle to get temperatures above freezing," he says. At the time, geologists first began to recognize that the shapes of the continents matched each other, almost like scattered puzzle pieces, explains Grotzinger. "Aside from the shapes of the continents, geologists had paleontological evidence that fossil plants and animals in Africa and South America were closely related, as well as unique volcanic rocks suggestive of a common spatial origin. The problem was that the broad community of earth scientists could not come up with a physical mechanism to explain how the continents could plow their way through Earth's mantle and drift apart. It seemed impossible. The missing component was plate tectonics," he says. "In a possibly similar way, we are missing something important about Mars." Before Curiosity landed on Mars, scientists proposed that Gale Crater had filled with layers of sediments. Some hypotheses were "dry," implying that the sediments accumulated from wind-blown dust and sand, whereas others focused on the possibility that sediment layers were deposited in ancient streams and lakes. The latest results from Curiosity indicate that these wetter scenarios were correct for the lower portions of Mount Sharp. Based on the new analysis, the filling of at least the bottom layers of the mountain occurred mostly by ancient rivers and lakes. "During the traverse of Gale, we have noticed patterns in the geology where we saw evidence of ancient fast-moving streams with coarser gravel as well as places where streams appear to have emptied out into bodies of standing water," Vasavada said. "The prediction was that we should start seeing water-deposited, fine-grained rocks closer to Mount Sharp. Now that we've arrived, we're seeing finely laminated mudstones in abundance." These silty layers in the strata are interpreted as ancient lake deposits. "These finely laminated mudstones are very similar to those we see on Earth," says Woody Fischer, professor of geobiology at Caltech and coauthor of the paper. "The scale of lamination—which occurs both at millimeter and centimeter scale—represents the settling of plumes of fine sediment through a standing body of water. This is exactly what we see in rocks that represent ancient lakes on Earth." "Paradoxically, where there is a mountain today there was once a basin, and it was sometimes filled with water," said Grotzinger. "Curiosity has measured about 75 meters of sedimentary fill, but based on mapping data from NASA's Mars Reconnaissance Orbiter and images from Curiosity's cameras, it appears that the water-transported sedimentary deposition could have extended at least 150–200 meters above the crater floor, and this equates to a duration of millions of years in which lakes could have been intermittently present within the Gale Crater basin," Grotzinger said. But layers deposited above that level do not require water as an agent of deposition or alteration. "Above 800 meters, Mount Sharp shows no evidence of hydrated strata, and that is the bulk of what forms Mount Sharp. We see another 4,000 meters of nothing but dry strata," Grotzinger said. He suggests that perhaps this segment of the crater's history may have been dominated by eolian, or wind-driven, deposition, as was once imagined for the lower part explored by Curiosity. This occurred after the wet period that built up the base of the mountain. As climatologists try to develop new atmospheric models, help should be coming from the continuing explorations by Curiosity. "There are still many kilometers of Mars history to explore," says Fischer. He thinks that some of the most exciting data yet may come in the next few years as Curiosity climbs higher on Mount Sharp. "The strata will reveal Gale's early history, its story. We know there are rocks that were deposited underwater, in the lake. What is the chemistry of these rocks? That lake represented an interface between the water and the atmosphere, and should tell us important things about the environment of the time."